After an Apple Watch, but don't want to break the bank? 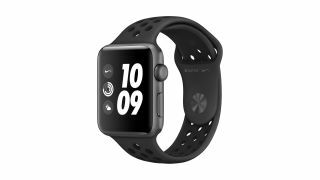 We may have a deal that suits you perfectly as it offers the Apple Watch Series 3 Nike+ special edition at the lowest price we've ever seen. If you buy it now from Argos, you'll be able to get the larger 42mm version of the watch for only £259. When we looked to buy the 42mm Nike+ special edition, delivery wasn't always available all over the country. However, we did find it was still in stock in a number of stores at the time of writing. The Apple Watch 3 has become more affordable since the launch of the Apple Watch 4, but it's still difficult to find the company's 2017 wearable at a price this low. It's a £50 discount compared to what Argos was selling this watch for a few weeks ago. We praised the Apple Watch 3 upon its release for its strong battery life and impressive fitness features, plus with the Nike+ edition you'll get a sport-appropriate strap too.